New Album Featuring Guest Appearances by Cristina Scabbia (LACUNA COIL), Marko Hietala (NIGHTWISH), John Wetton (KING CRIMSON, ASIA) and More! 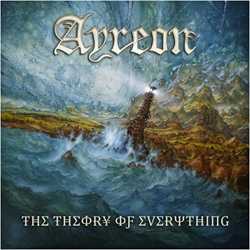 On October 29, 2013, the new AYREON album, The Theory Of Everything, will be released in the United States via InsideOutMusic, and pre-order options are available now. Head over to the CM Distro Shop here to reserve your Digipack copy today (CLICK HERE). The digipack edition comes with a limited edition Deluxe Artbook (2CD, DVD + Bonus 2CD), which includes a 48-page perfect binding book with plenty of artwork, the bonus DVD with a making of feature, full length interviews and the recording session time lapse footage and in addition all tracks as instrumental versions on two CDs. There is also a special pre-order package COMING SOON, which will be available through the CM Distro Shop that includes a t-shirt, 7-inch single, and poster all bundled together with the limited deluxe Artbook version of the album. Also, a new trailer was posted previewing bits of the new album! Watch it below.